It’s official now. The Indian Olympic Association (IOA) has formally announced the names of the 21 athletes who had tested positive for banned substances at the National Games held in Hyderabad and Visakhapatnam in December, 2002. After losing the first two tests of the series to Australia, the West Indies face more problems in the third starting tomorrow as the tourists welcome back Glenn McGrath, one of the game’s finest fast bowlers. 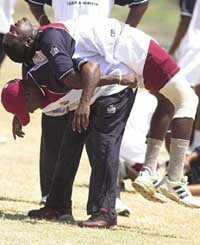 West Indies captain Brian Lara lifts Jermaine Lawson (top) on to his back during a team practice in Barbados on Tuesday. The third Test between West Indies and Australia starts on Thursday at the Kensington Oval in Bridgetown, Barbados. Zimbabwe arrive in England tomorrow for a cricket tour in danger of featuring more drama off the pitch than on it. Cricket bible Wisden ripped the International Cricket Council apart, criticising many of its policies, including its handling of the Zimbabwe crisis during the World Cup, saying it had "heaped shame on the game." Chairman of Hero Indian Sports Academy Kapil Dev and former England cricketer Ian Botham at a Press conference before academy's awards presentation function in New Delhi on Wednesday. Libyan Football Federation vice-president and national team’s captain Al-Saadi Gadhafi, son of Libyan leader Muammar Gadhafi, controls a ball during a training session with his national team in Tripoli on Tuesday. 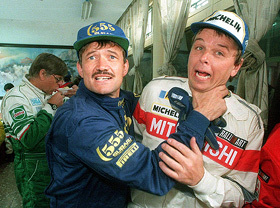 Undated file photograph of New Zealand rally driver Possum Bourne (L) playfully throttling winner of Hong Kong Beijing Rally and new Asia Pacific Rally Champion Kenneth Eriksson of Sweden in Beijing. Bourne died on Wednesday, 12 days after suffering severe head injuries in a crash, his family said. Bourne, 47, had been in a drug-induced coma and on life support in Dunedin Hospital since the head-on collision while checking a hill climb race course on Good Friday over the Eastern weekend. Bourne was New Zealand's only full-time professional rally driver, a three-time Asia-Pacific champion and seven-time Australian rally winner. The Indian challenge in the $25,000 Indian Oil Servo ATP Challenger Tennis Tournament came to an end here today when Prakash Amritraj bowed out with a 6-7 (6/8) 4-6 loss to Yves Allegro of Switzerland in the second round. Wimbledon is to scrap the requirement that players bow or curtsey to the royal box - a tradition dating back to 1922 that had many women players from abroad in difficulties. A penalty taken and converted 24 days after it was awarded gave Argentina’s Atlanta a 1-0 win over Defensores de Cambaceres in a second division match suspended because of a crowd riot with five minutes to go. More than 400 school sportspersons of the Punjab Education Department were honoured here today in the presence of Education Minister, Punjab, Mr Khushal Behal. These school sportspersons had won medals in the 48th National School Games. The inaugural Major Jagpal Memorial Junior Inter-Public School Basketball Tournament for boys and girls is being hosted and organised by Pinegrove School, Subathu, from May 1 to 3, Capt AJ Singh, Headmaster of the school, announced here today. On the basis of their first innings lead of 52 runs, hosts Ludhiana secured five points against Minor Districts-XI in the Punjab State Inter-District Cricket Tournament (below-15) for the Sushil Bali Trophy at the S D Government College ground here yesterday. The following players have been selected to represent Sangrur in the Punjab State Junior Basketball Championship being held at Amritsar from May 1 to 4, according to G.S. Sekhon Secretary, District Basketball Association. The new game of cricket, invented by Goan youths, has now become a popular pass time. The IOA medical commission/anti doping commission, which met under the chairmanship of Dr Manmohan Singh, at the IOA conference hall at the Jawaharlal Nehru Stadium here today, gave a hearing to the guilty athletes to present their side of the story before releasing the list of the names. Though the IOA had called all the 22 athletes whose urine samples had tested positive for banned substances at the Sports Authority of India (SAI) dope testing laboratory in New Delhi for a hearing, only 13 showed up. They were Laxman Singh, Kalyani Alapati, Udayalaxmi Peddinendi, Kavita Pandya, Jagdish Basak, Nijappa Yenteth, Srikanth Poosa, Sandeep Kumar Jogu, Anita Kumari, Tejinder Singh, Gurpreet Singh and Ranjit Singh. Dr Manmohan Singh said swimmer Amar Muralidharan’s case had been kept in abeyance, pending further tests as his testosterone level was found to be above the permissible level, and a final decision on him will be taken only after he is put through three more dope tests, which he would be called upon to undergo without prior notice. IOA president Suresh Kalmadi and Dr Manmohan Singh jointly announced that "the 21 dope samples have been declared positive for violation of anti-doping code". Out of the 21 who tested positive for various banned substances like steroids, stimulants and masking agents, eight belong to Andhra Pradesh, who had topped the medal chart in the National Games, five hail from Chandigarh, three from Punjab, and one each from Haryana, Delhi, Maharashtra, West Bengal and Chattisgarh. There are five gold and silver medallists each, and four bronze winners. Among them, eight are athletes, three are boxers and seven are weightlifters. The following are the 21 guilty sportspersons: Laxman Singh (rowing, Chandigarh, tested positive for anabolic steroid nandrolone, bronze medallist), Gurvinder Singh (volleyball, Punjab, nandrolone), Ramandeep Singh (athletics, Chandigarh, stimulant mephentermine, silver), Kalyani Alapati (athletics, Andhra Pradesh, nandrolone, bronze), Udayalaxmi (athletics, Andhra, nandrolone, gold), Jagdish Basak (athletics, Punjab, nandrolone, gold), Maha Singh (athletics, Haryana, mephentermine, silver), Nijappa Yenteth (cycling, Andhra, stimulant pseudoephedrine, bronze), Hirdayanand Singh (athletics, Andhra, stimulant ephedrine, gold), Bhagya Rajan Deverdaran (boxing, Andhra, anabolic steroid mesterolone), Srikanth Poosa (boxing, Andhra, mephentermine, silver), Sandeep Kumar Jogu (boxing, Andhra, nandrolone and mephentermine, silver), Sima Golui (weightlifting, Bengal, nandrolone), Anitha Kumari (weightlifting, Jharkhand, stimulant nor pseudoephedrine, silver), Parmanand (weightlifting, Delhi, nandrolone), Tejinder Singh (weightlifting, Punjab, ephedrine and pesudoephedrine, gold), Gurpreet Singh (weightlifting, Chandigarh, ephedrine, silver), Venkateshwar Rao Pemmasani (weightlifting, Andhra, nandrolone) and Ranjit Singh (weightlifting, Chandigarh, mephentermine). Dr Manmohan Singh said none of the sportspersons who deposed before the commission admitted to having taken the banned substances. Nor any of them blamed the coaches or officials for their doping offence, including Udayalaxmi, who had earlier accused some officials of the Andhra Pradesh Sports Authority of forcing her to take the banned substance in order to "boost" her medal prospects. Dr Singh said the commission succeeded in establishing the sportspersons’ guilt by putting incisive questions to them. He said 465 urine samples were colleted from medal winners, record breakers and some of them picked up on a random basis at the eight dope collection centres set up Hyderabad and three at Visakhapatnam. Mr Kalmadi said the Andhra Pradesh Government had spent over Rs 25 lakh to make fool-proof arrangement for dope testing as the IOA and the sports federations were determined to root out the evil of doping from Indian sports. "We will spare no effort in rooting out this menace for all time to come", asserted IOA secretary-general Randhir Singh, who is also a member of the World Anti-Doping Agency. Mr Kalmadi said the positive dope testing cases in the National Games held in Andhra Pradesh will be treated as a "first offence" by the guilty athletes as the IOA had not taken cognizance of the 19 positive dope testing cases emerged at the National Games held in Punjab in 2000 as the dope tests in Punjab were conducted at the last minute, and not in an organised manner. No proper record of the dope test results were maintained either. Mr Kalmadi said the concerned federations would have to take punitive against the guilty sportspersons immediately in tune with the laws laid down by the international federations. But sports medicine experts aver that if any of the sportspersons, held guilty by the IOA, challenges the medical commission’s ruling, it can create a piquant situation as the SAI dope testing laboratory in Delhi, which is not accredited by the International Olympic Committee, does not enjoy any legal sanctity. They say the test results of the SAI lab, at best, can be taken as an indicator, but not as an irrevocable verdict. Mr Kalmadi and Mr Randhir Singh asserted that the doping offence at the National Games have "tarnished the image of the country, and the offenders will be dealt with severely". The sanctions against the offending sportsperons will include ban, suspension, disqualification, and the withdrawal of medals, certificates, cash and other awards presented to them. Mr Kalmadi said federations would be asked to conduct out of competition tests to detect dope users before major events. McGrath, who has taken 422 test wickets but missed the first Test after his wife fell ill, will boost Australia’s attempt to became the first visiting team to achieve a whitewash in the Caribbean. 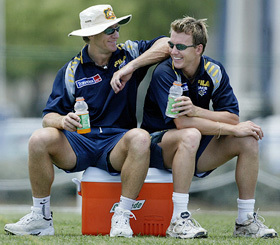 "I think the way we are going it would be very hard for us to be beaten," McGrath told reporters. "I would probably be very disappointed if we don’t win the series 4-0." Australia won the first Test by nine wickets in Guyana and the second in Trinidad by 188 runs but captain Steve Waugh believes they can still improve. "We have played excellent cricket so far but we can play better and this a good opportunity to show people how good we are," he said. "Our fielding could get better, we missed a couple of opportunities (in the second test) and we need to be a bit more sharp in the field. That’s where we are looking to improve." Australia have yet to name their team but Waugh has already confirmed that McGrath will play and that the visitors are likely to continue fielding five bowlers. "I assume it will be a similar plan to the last two tests," he said. "Five bowlers gave us more options." Waugh’s other worry is to stop West Indies captain Brian Lara, whose last three innings have produced two centuries and a score of 91. "He’s a world class player, we have some specific plans for him in this match, different to what we had before," he said. The West Indies, who fielded only three frontline bowlers in Port of Spain and took only eight wickets in two innings’ as Australia declared twice, are expected to make changes. Jamaican opener Chris Gayle, controversially omitted from the first two tests following confusion over West Indies eligibility rules, could be back along with fast-bowler Jermaine Lawson, who sat out the second Test with chicken pox. Former West Indies fast bowler Michael Holding also called for Barbadian 21-year-old Tino Best to be given his Test debut. "I think we have done very well in the batting department where we have brought in a lot of youngsters and they have shown promise and they have now started to produce," he said. "I think we now need to do the same thing with our bowling department," said Holding, who captured 249 test wickets during a 12-year Test career from 1975 to 1987. Human rights activists have promised a string of protests against President Robert Mugabe’s government throughout the tour, while some British politicians have also spoken out against the visit. That has shifted the focus firmly from the cricket — Zimbabwe, ranked a lowly ninth out of 10 in the test championship, will field a young and inexperienced side — to security issues. England and Wales Cricket Board (ECB) spokesman Mark Hodgson said today: "We have been reading about what potentially may happen." "We have been discussing security around international matches and the appropriate measures will be put into place." Human rights activist Peter Tatchell, who has made several attempts to have Mr Mugabe arrested, has been quoted in the British media warning of protests at matches. Zimbabwe are due to play two Tests against England before taking part in a triangular one-day tournament involving South Africa. Security at English cricket venues, which are unprotected by fencing, has been a major issue for several years. Tatchell and a group of fellow protesters highlighted the point by forcing their way past Lord’s security guards during an anti-Mugabe protest before this year’s World Cup in southern Africa. During the 1999 World Cup in England, players from several teams complained they were forced to run off at the end of matches because stewards were unable to stop crowd invasions. In 2001 during a triangular series between England, Australia and Pakistan, experimental plastic fencing and extra stewards were introduced. But England conceded defeat against Pakistan rather than resume the game at Headingley after Pakistan fans, sensing victory, ran on to the square and ripped up the stumps. A steward was injured during the invasion. Australia captain Steve Waugh also led his side off at Trent Bridge against Pakistan after a firecracker exploded near fast bowler Brett Lee, while Michael Bevan was struck in the face by a full beer can thrown from the crowd after Australia beat Pakistan in the final at Lord’s. Spectators invading cricket pitches in England now face fines of up to 1,000 pounds ($1,592). Before the World Cup earlier this year, the British government called on England to boycott their match in Zimbabwe as a protest against Mugabe. England rejected those overtures, saying they were sportsmen and not politicians, but eventually forfeited the match over security concerns. Zimbabwe were suspended from the Commonwealth last year after allegations that Mr Mugabe had rigged his re-election as President. Blasting the ICC for being "at their worst" for much of the past year, Wisden, published today, said "blundering ICC bosses ignored public opinion and turned a blind eye to human rights abuse, ordering Andy Flower and Henry Olonga to lay down their acclaimed black armbands". Editor Tim de Lisle accused ICC chief executive Malcolm Speed of "reacting like a new father who hears someone criticising his baby" when England’s aborted tie in Harare should have been switched to South Africa. And while ICC failed to address basic issues, like polite protesters being thrown in jail at the Zimbabwe-Australia tie in Bulawayo, fans at the World Cup were frisked to make sure they did not upset sponsors by carrying the wrong brand of soft drink. "Just when cricket has become more fun to watch, its bosses have made it hard to follow. For much of the past year, the ICC were at their worst, which is saying something," De Lisle wrote. "Their Champions Trophy did not produce a champion. Their Test championship produced the wrong one (South Africa). Their new one-day championship was so arcane that it went virtually unnoticed. Their World Cup consisted of more than 50 matches but hardly any real contests. "And they adopted a stance on Zimbabwe that shamed the game." 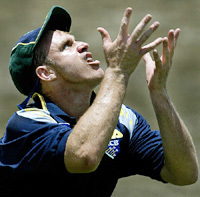 Nasser Hussain and Shaun Pollock endured miserable World Cup campaigns but yesterday both gained some consolation as they were named in cricket bible Wisden’s five players of 2002. The former England and South Africa one-day captains joined Australian opening bat Matthew Hayden, England’s world leading batsman Michael Vaughan and Surrey’s Australian-born skipper Adam Hollioake. Gregory Carraz of France, the second seed and winner of last week’s Challenger in Bangalore, survived a scare from Dmitry Vlasov of Russia to emerge 3-6 6-4 6-3 winner. Israeli Jonathan Erlich, who had come through three qualifying rounds, packed enough stamina to win 2-6 7-6 (7/4) 7-6 (7/4) in two hours and 15 minutes against another Russian Yuri Schukin, in his fifth consecutive three-set match in the tournament. Rodolphe Cadart of France, too, came through a three-setter, winning 3-6 6-1 6-2 over German Maxmilian Abel while Yen-Hsun Lu of Chinese Taipei who defeated Vijay Kannan in the first round gave a walkover to Thailand’s Danai Udomchoke citing a knee injury. The event has turned out to be a disappointing one for the home fans as all the Indians have made their exit with three more days still to be left. The victories of Karan Rastogi over three higher ranked opponents in the qualifying rounds might have gladdened the hearts of the hosts but the exit of Davis Cup players Harsh Mankad and Rohan Bopanna was numbing. Prakash Amritraj, who resides in the USA and became eligible to play for India only this month, raised some hopes when he won the first round yesterday but he stood exposed against the 243rd ranked Allegro whose allround game he was unable to match. "The surname is not going to help, is it? When you go into the court it is the skill that counts," said Amritraj. Amritraj gained the initiative when a rusty Allegro dropped serve in the fifth game of the first set. But soon the Swiss hit the right gear and began playing his shots to put the pressure back on his opponent. The Duke of Kent, who has been president of the All-England Lawn Tennis and Croquet Club since 1969, and is a cousin to both the queen and Prince Philip, issued the order yesterday, indicating the tradition was on the way out. In 1998 Buckingham Palace issued instructions that those introduced to the queen or Philip need not bow or curtsey, but if anyone wanted to continue the tradition, they could do so. Since then the practice has begun to die out. The teams played the remaining five minutes, starting with the penalty that sparked the riot, behind closed doors at a neutral ground. 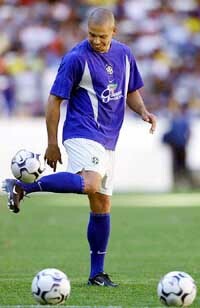 Striker Lucas Ferreiro scored from the spot. Though the official invitation card of the department mentioned that the Chief Minister would be the chief guest, he did not come. Earlier Mr Behal, in his speech stressed the need for improving sports culture in schools. He appealed the sports teachers to learn the new techniques and asked the sportspersons to continue working hard. He cited the example of young gymnasts of Gurdaspur, who at a tender age, cornered glory for the state. Punjab this year secured eight gold medals in volleyball, kabaddi, kho-kho, football, handball, basketball and badminton. The state secured 12 silver medals in softball, football, cricket, judo, handball, lawn tennis and six bronze medals in kho-kho, football, hockey, baseball and wrestling in various age groups in under-14, under-17 and under-19 sections. In the individual section, the Education Department claimed to have bagged 26 gold medals and an equal number of silver medals and 44 bronze medals. The gold medal winners were given a cash prize of Rs 1500 each, while silver medallists received Rs 1000 each. Bronze medallist were given Rs 750 each. A few outstanding coaches were also given Rs 250 each in recognition of their hard work. The inaugural Major Jagpal Memorial Junior Inter-Public School Basketball Tournament for boys and girls is being hosted and organised by Pinegrove School, Subathu, from May 1 to 3, Capt AJ Singh, Headmaster of the school, announced here today. Pinegrove School will host this tournament in its senior school location at Subathu. He said that nine schools from all over north India would be participating in the three-day tournament. The school has instituted this tournament to give an opportunity to children to get tournament exposure at a tender age, besides stimulating interest in basketball. Eight teams of boys have been divided into two pools and four teams of girls have been placed in one pool. The Lawerence School, Pinegrove School, Military School (Chail) and Yadvindra Public School (Patiala) have been placed in pool A (boys) while Bishop Cotton, School, St. Stephen’s (Chandigarh) and Yadvindra Public School, (Mohali) have been placed in pool B. The girls pool comprises the Lawerence School, Pinegrove School, Punjab Public School (Nabha) and Yadvindra Public School. The tournament has been started in memory of Major R.S. Jagpal, an ex-NDA Madras Sappers Officer, who was posted as Officer Commanding of a bomb disposal platoon in J&K where he laid down his life while on active service. On the basis of their first innings lead of 52 runs, hosts Ludhiana secured five points against Minor Districts-XI in the Punjab State Inter-District Cricket Tournament (below-15) for the Sushil Bali Trophy at the S D Government College ground here yesterday. The three-day match ended in a draw with the Minor Districts-XI , requiring 257 runs to win, were struggling at 120 for 8. They had to content with three points. Brief scores: Ludhiana (Ist innings)- 269 all out ( Bharat Malhotra 71, Amrinder 29, Savneet Singh 21, Vishwajeet Singh 39, Mukul Gupta 15, Sushyant Kohli 31, Sahil Bakhshi 4, Atul Kohli 22, Amrit 4 for 42 and Abhinav 3 for 42). Minor Districts-XI (Ist innings) 217 all out ( Jatinder 36, Vishal 9, Neeraj 27, Abhinav 8, Sandeep 91, Rohit 19 and Amrit 6, Gagandeep Dhand 6 for 42 and Mukul Gupta 3 for 48). Ludhiana (IInd innings)- 204 for 9 ( Pankaj Kumar 37, Atul Kohli 76, Sushyanat Kohli 20, Mukul Gupta 23, Gagandeep Dhand 11 and Vishwajeet 8, Abhinav 4 for 38, Arvind 1 for 27 and Manik 3 for 10). Minor Districts-XI- (2nd innings)- 120 for 8 ( Jatinder 22, Sunil Gatta 50 and Rohit 13 n.o, Gagandeep Dhand 3 for 27 and Pankaj 2 for 31). Boys-Charanjit Singh, Avtar Singh, Anil Kumar, Amandeep Singh, Avtar Singh, Parminder Singh, Kanwaljit, Avtarn Singh Kuldip Singh, Sukhwinder Singh, Kuldeep Singh. Girls:- Husna Rani, Rajandeep, Jagbir, Harpreet, Asha Rani, Rajni Bala, Manpreet Kaur, Poonam, Suman Lata, Jaswinder Kaur, Seema Rani.